I'm no good at those end-of-the-year wrap-up posts. I feel like I should say something meaningful, a grand summary of what goals I've accomplished, highlights of the year, resolutions kept. But, truthfully, all that makes me a little sad. I like New Year's Eve for the promise it brings, the fresh feeling, the endless possibilities. I can swear a little less, be much more patient, create anything in the coming year. 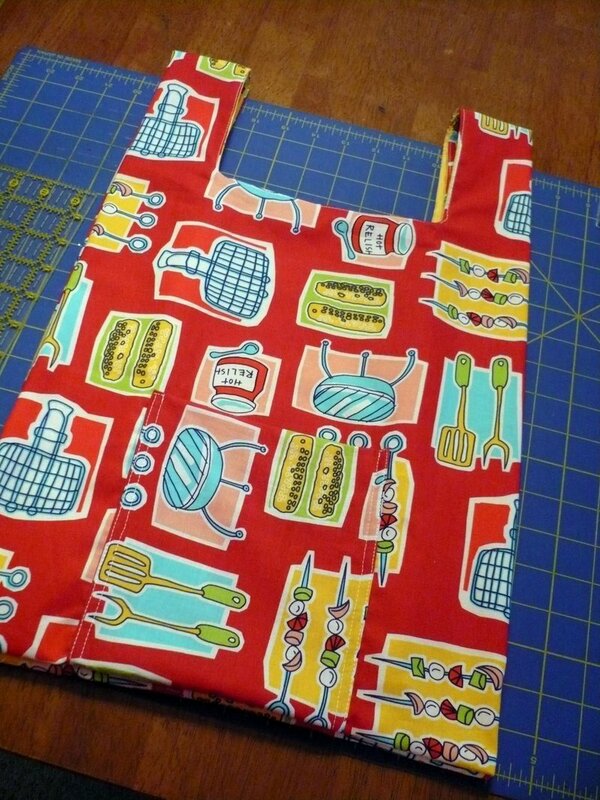 I had grandiose plans of making my relatives go green this year, and I was going to sew up reusable grocery bags for everyone at our Christmas gathering. But after I finished up the gifts for Becca's class, I'd run out of time. I haven't completely given up on the bags, just couldn't make them for Christmas 2007. The tutorial was incredibly well written and the end product something I was really proud of, so I'll be making more. Probably even one for myself (gasp!). I may even make a zippered drawstring pouch to hold it, with a strap that I can attach to the inside of my purse or backpack so I'll always have it with me. My problem is that although I have reusable bags, I leave them in the car and forget all about them until the bagger is bagging up my stuff... doh! Anyway, considering it took me all day to make the two I did manage to complete, I gave up and turned to tissue and coffee cup cozies instead. 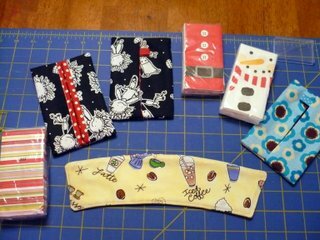 I had made a matching set for Becca's teacher, and thought it made a nice presentation, stuffed with a holiday-patterned tissue pack. My computer ate that photo, but it turned out well so I made more. The coffee cup cozy was made with insulated batting, so it should work very well. That's good for saving at least a few cardboard sleeves a year, so I guess that's a tiny little score for the environment. And my other finished handmade gift was a scarf, knitted using this pattern as a guideline, for a very special 6 year old who lives in a cold, snowy part of the country. Hope she likes it! I'm still not done with all the Christmas knitting, but the crucial one is almost picture-ready (it's coming, Peter! ), and the other can now be for someone's birthday present in November, instead. And so it begins already. Maybe since I started the day after Christmas, I'll do a better job finishing up my handmade presents in 2008. Thanks, 2007. I can't believe you're saying goodbye so soon. You always have the most clever gift ideas. I enjoy reading your blog and watching your girls grow. I love the color theme photos/entries that you prepare. Your projects look terrific!!! I love the bag fabric you chose. Thanks for posting the link to the tutorial. I really like the shape of the bag. I hope you have a wonderful 2008! Thank you very much for the lovely Christmas Party. The food was sumptuous and delicious. The kids are adorable. The adults are the warmest. And I love the tissue cover. I never have to have those old crumbled tissues in my purse anymore. I am inspired to use cloth napkins from now on! Happy New Year to you & your beautiful family. Wishing you a healthy and happy. I really love your blog. I like that you are "real" and love your crafting ideas. I can relate to you. I have 3 kids, but mine are older (21, 18 & 13) It goes so fast. Enjoy your children now because before you know it they are out doing their own thing. You have gorgeous kids. You are doing a great job with them!!! My favorite picture of yours is the one with your youngest holding on to the van door and swinging. :o) Don't you wish you could do that too? Looking forward to another year with you. Keep up the great blog. no need for a tidy wrap up of your year...you accomplish so much it would be quite a chore to create a summary of it all. eyes on 2008 :) Happy New Year Michelle!! All your handmade gifts are just lovely - I especially love the shopping bag. Great idea. Happy New Year!! Wow! You continue to amaze me. :o) You did a great job on the cozies, and that will help with the going green effort for sure. 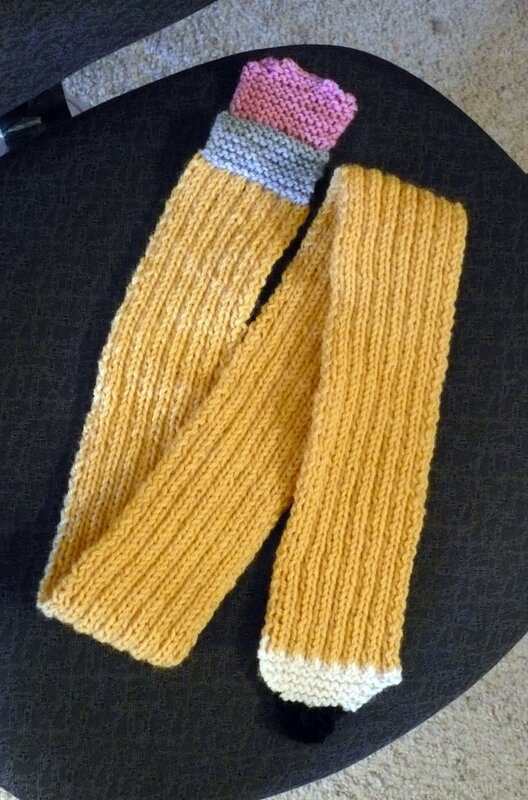 Your scarf is wonderful, looks just like a pencil! Happy New Year to you and your family. I hope that 2008 brings you much joy, happiness, and crafting! Beautiful bag! I love the shape. I might have to try that one out sometime. Happy New year to you my friend! I hope it is full of sweet sibling love, great health, lots of happiness and a huge dose of creative juice! The bag design is great! I love your fabric! you made the scarf, it looks great! what did you think of the pattern, is there anything you would change? Those all came out great. I made my husband a shopping bag from that tutorial for Christmas, and I'm about to make a couple more with some new fabric I got.